WEB-CAM has been hard welding and grinding cams for over 50 years. With their knowledge, and long time involvement with the racing industry WEB-CAM has proven to be the best. Many of our products have helped racers win national championships and set national and world records. The top professionals use our cams and provide us with the edge over our competition that includes race track and dyno testing. Whether you choose a cam for street, strip or off-road you can be certain the same attention to detail is given to all applications. JE Pistons the leader in piston manufacturing for the pros. We have a large supply of shelf pistons as well as the ability to make custom pistons specific for your application. Whether it's the smallest of sport compacts or the largest of V8s, count on JE Pistons...the Measure of Performance. Wiseco Pistons are one of the best replacement pistons on the market. Available for most 2 strokes and 4 stroke applications. Increased compression and larger displacement pistons provide a big gain in power and torque. 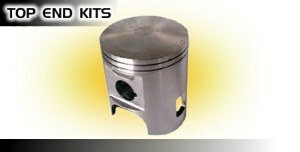 C&D Racing offer Wiseco, and JE, the highest quality and most reliable performance pistons manufactured. C&D Racing strongly recommends that you install an increased compression piston at the same time you install a performance cam. The machine will produce more power over a wider rpm range than an engine with only the performance cam installed.